The Romanian Foreign Ministry has fired its spokeswoman after Germany's foreign minister was handed a gift with a map of France instead of Germany. German Foreign Minister Frank-Walter Steinmeier received the gift— the German flag contained in a map of France— from Romanian counterpart Bogdan Aurescu after a news conference on Monday to mark 135 years of diplomatic relations. Aurescu personally apologized for the mix-up, as did the printing company. On Wednesday, the foreign ministry said it had fired spokeswoman Brandusa Predescu saying "the incident...projected a totally unfavourable image" of the agency. Romania said Steinmeier had responded diplomatically, saying he hadn't even noticed the gaffe. Authorities in Romania have charged Finance Minister Darius Valcov with influence peddling and detained an influential mayor and three others in a separate corruption case. Valcov was questioned and charged Friday in a case that stems from his time as mayor of the southern city of Slatina. Prosecutors said Valcov is suspected of favouring a local businessman for contracts with the city hall in 2009 in exchange for receiving a 20 percent cut. They said he received 2 million euros ($2.11 million) between 2010 and 2013. Separately, Marian Vanghelie — known for his influence in the ruling Social Democracy Party until recently — was detained early Friday. A court will decide later whether to formally arrest him on suspicion of taking bribes, money laundering and abuse of his position. Three others suspected of being part of the scheme were also detained. In Vanghelie's case, prosecutors are investigating whether he also took a 20 percent cut of all contracts he signed as mayor from 2007. They say contracts from 2007 to 2015 were worth 2 billion lei (450 million euros or $475 million). Vanghelie was considered a deal-maker in the ruling party until he was expelled after openly criticizing Prime Minister Victor Ponta. A populist and entertaining figure, Vanghelie, 47, painted drab high-rise communist-era apartment buildings bright colours after he was first elected mayor of District 5 in 2000 and easily secured re-election in 2004. He was known for verbal gaffes and grammatical errors which did not deter him from speaking bluntly in public, and he shrewdly tapped into the notoriety he gained. Despite his lack of formal education— he gained the equivalent of a high school diploma when he was 33 — he was known as a savvy political operator. Vanghelie was criticized for a lack of transparency in his town hall budget, but appeared to avoid investigation which critics said was due to his connections. His girlfriend, legislator Oana Niculescu-Mizil, was also questioned. She and Vanghelie have denied wrongdoing. As she exited the prosecutors' office on Thursday, Niculescu-Mizil said she would resign from Parliament and surprised reporters by announcing she was pregnant. Channel 4 says the series – which ended on Tuesday – explored the lives of Romanians trying to make a new life in Britain, and sought the truth behind the headlines about immigration. The first programme featured Alex, who lived in a car park next to Victoria station in London, and a Romany man who struggled to settle in Liverpool. 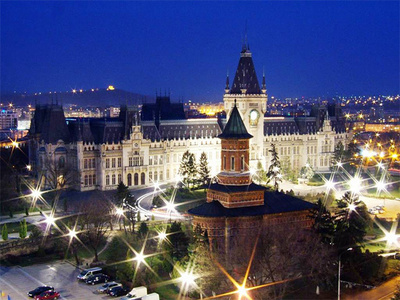 The second and third episodes also examined the poverty of Romania, where the richest 10% would be among the poorest 10% in the UK. The narrator says: “When you live in a place as poor as this, then where can you find hope?” One immigrant coming to the UK says to camera: “I am sure the English will throw us a rope.” A review in this newspaper described the programme as “an intelligent programme likely to dispel prejudices”, and it has been widely applauded for its humanity. However the response from some Romanians in the UK has been far less complimentary, with a silent protest recently held by students outside C4’s offices.